Rostock max sorbothane dampening replacement feet by earlynerd is licensed under the Creative Commons - Attribution license. Update: added a "spring" type foot (best printed in ABS or other non-brittle material) with the sorbothane pads mounted to the bottom. have not tested them but it feels like it may be a bit too soft. I'll update with results. 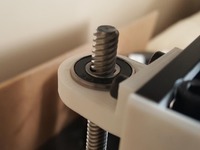 Some bolt-on replacement feet to reduce the vibration coupled into your desk, workbench or floor. I made them to help prevent bothering the neighbors if I want to print though the night. 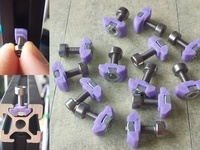 They use the nylon nuts and bolts which hold the stock rubber foot caps on, simply uncrew the stock ones, slide the nylon bolt through the cup, use a bit of double sided tape (or dampeners with adhesive pre-applied) stick on the dampener into the cup, and reinstall onto the printer base. 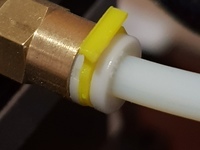 I also included some optional caps to go on the bottom side of the dampener, as I've found the sorbothane material to be very sticky which can cause them to fuse to any wood or laminate (and possibly other) surfaces they touch over time. I printed both parts from TPU to give them a little bit of grip, but ABS or PLA should work fine too if youre not set up for printing flex materials. 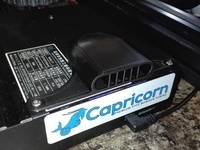 Here's the sorbothane dampeners I recommend, They seem to work fairly well with the TPU mounts and pads, no real motor vibration can be felt in te work surface but retractions and sudden moves can still be felt. I'm experimenting with a combination of ABS "spring" with the sorbothane pads on the bottom of that to help absorb both lower and higher frequency vibrations.